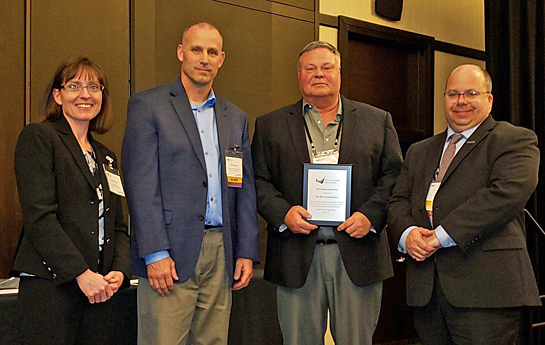 The Ohio Aviation Association recently presented its “Airport of the Year” award to Van Wert County Regional Airport. The non-profit association, comprised of airport management, airport governing bodies, and airport support entities such as consulting firms, aviation education groups, construction contractors, equipment providers, and aviation enthusiasts, awards scholarships, as well as several awards, including “Airport of the Year”, “Airport Manager of the Year”, and “Aviator of the Year”, at its annual meeting in April. The OAA promotes aviation by advocating on behalf of airports in Ohio, communicating the economic benefits of Ohio airports and the aviation industry, as well as educating and engaging its members and the public. The award was presented to Steve Bailey, airport manager, and Mike Keysor, president of the Van Wert County Regional Airport Authority, which is charged with overseeing the local airport and its day-to-day operations. The seven-member volunteer authority guides the development and growth of the airport primarily through personnel management and capital improvement planning. “Winning the award feels fabulous!” Bailey said on Friday. “The Airport Authority has been working extremely hard over the years to make the airport the gateway to the community. “We wanted the citizens of Van Wert to know how important it is to have a great airport,” Bailey noted, adding that most of the traffic coming to the airport is for business or those flying across the country who need a place to stop, relax, eat, shop, and sleep in Van Wert. The airport has recently become more proactive and aggressive in creating an airport that is not only inviting to general aviation traffic, but striving to provide the needs of corporate travelers and become the front door to the community and represent the northwest Ohio area. The last three years at the county airport have seen a change in direction and attitude as the Airport Authority developed a 10-year plan to transform the airport into the economic generator it can be. A look back at the previous 20-year period shows the airport was primarily in a maintain status, rather than growth. Like most general aviation airports, funding is often the roadblock to transformation, and this was true for Van Wert as well. Seeing a struggle just to match FAA grants, and upcoming projects like a new terminal building that don’t compete well for grants, authority members got creative. A capital fundraising campaign was prepared with a goal to raise in excess of $1 million. This would provide 10 years of FAA grant matching funds, but even more importantly allow for a new terminal building to be constructed to replace the more than 75-year-old current structure. Other funding needs included hangar upgrades and equipment. The Airport Authority, with the assistance of local business leaders, met with and explained the value of the airport to philanthropists. By the end of the campaign, nearly $1.2 million was pledged to the airport’s future. A relatively small community coming together to support the local airport to this scale is likely unheard of in Ohio. The new terminal will provide a fresh face to the community and will be built on the south side of the airport, which provides ample space for future growth and development. The aircraft apron will be constructed in 2019 to allow corporate jets to use the airport in a safe manner and not block the taxiway system. The airport finally will be developed into the economic driver it can be due to the hard work of volunteers and the financial support of those who understand the importance of the Van Wert County Airport.